I have used Excel for mac2011 to demonstrate a spreadsheet from my Manpower Planning friend Tony that finds appraisal results and values. 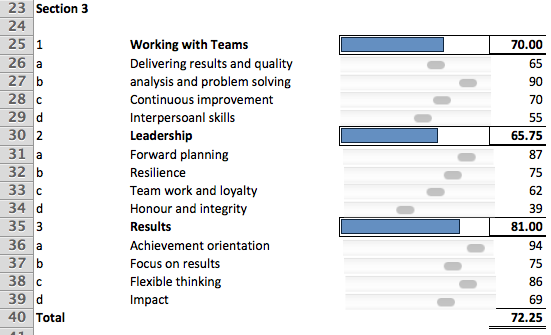 Excel 2010 copes equally well with what you are about to read about but the scroll bars look nicer on the mac! One of the features Tony wanted me to include was what he called sliders: Excel users call them scroll bars or scrollbars. Tony and Duncan did this! Tony and Duncan did this as well! Now click away from the scroll bar to deselect it and then use it! you can only use integers for the values to put into the scroll bars minimum value, maximum value and incremental value, that is. If you want decimals … well, see if you can work out how to make that work … it’s not too difficult! Well, that’s it! A really useful thing to know! One more thing, what we have created is a form based scroll bar not an ActiveX scroll bar … not that it really matters here! Following on from a comment I have added the following together with a file that you should find helpful. Thanks to Blog Member azamtokhi for encuraging me to add these! This relates to a NEW example. The purpose of the scroll bar can be to get a piece of information and use that to create the kind of table we have just seen under the revious example.. It could be just to get one piece of information or many. It could be to help us to control graphs or dashboards as we will see later. In any case, this is how scroll bars work. Click on Developer Tab, Controls, Insert and click on Scroll Bar (Form Control) which is third from the left on the second row. You cursor will change to cross hairs and you can draw the outline and size of your Bar wherever you want now: in this case the bars look much better drawn vertically rather than horizontally. In our case we drew it to cover the range A8:A14 and made it just wide enough to look pleasing, which is where it stays now. Right click on the Scroll Bar and select Format Control at the bottom of the menu you will see. Click away from your Scroll Bar now to deselect it and then click on its down arrow. In this case there is nothing to see: you don’t see aaaa, bbbb … yet, unlike the Combo Box. However, to see what we need, we now do exactly what we did with the Combo Box except in a different table. Again, the Cell link is the key to using the scroll Bar: click somewhere on the scroll bar and the number in cell I24 changes. Since Combo Boxes and Scroll Bars are rather more complex that data validation, try these exercises. 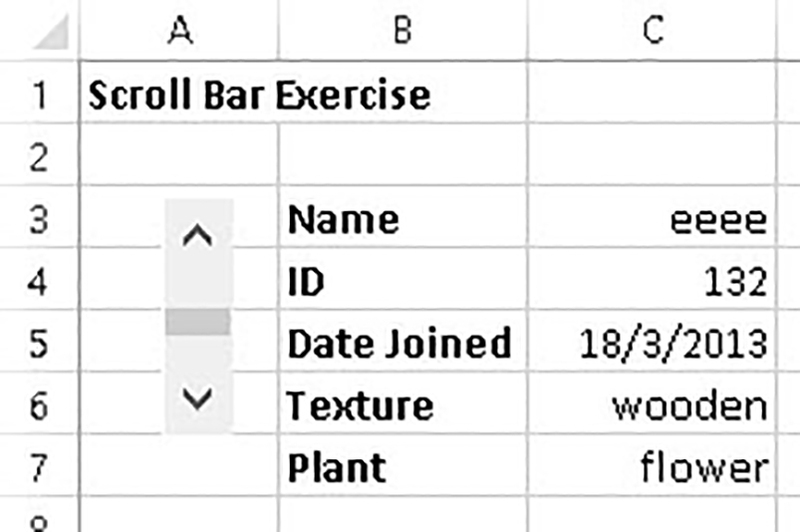 2 Use your Scroll Bar to create the following table ON A NEW WORKSHEET, call the worksheet forms_2. To complete this exercise you should use an ARRAY ENTERED TRANSPOSE formula to create the headings in column B and you should use additional column heading controls in your VLOOKUP() formula. Make the Page Change value in the Scroll Bar dialogue box equal to 3. Add some Alt text: make it clear and understandable! 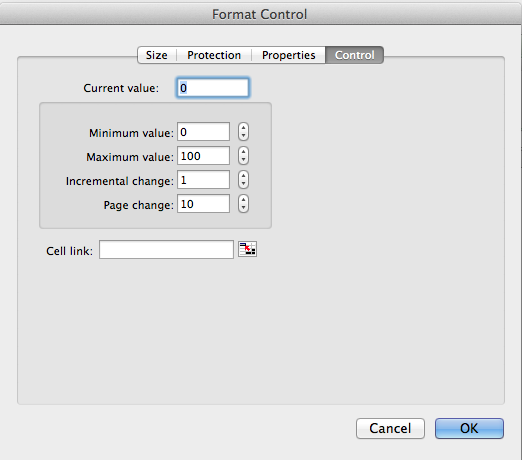 Finally, to avoid conflict with your other Scroll Bar in this work book, make forms!I25 your cell link. where is the file to download ??? I have now added another example to the page and I have included an Excel file for you to download! Duncan, thanks for these examples. May I ask how you formatted the slider controls in your first example please? I can’t seem to configure my excel for mac (v 15.33) sliders to anything but the boring default grey mottled things. They look like some sort of 90s throwback to me. Thanks for the question Rob. Good news and bad news: all of these features from Excel are made to look drab! There is no way of making them more colourful except by means of VBA, I think. I don’t program with VBA so cannot really comment. The blue sliders you see are not really sliders: they are data bars created by using conditional formatting and you can choose any colour you like for that! I do have that file if you would like to see how to make the blue data bar. Otherwise, take a look around this blog for inspiration! Thanks very much Duncan, I’d very much like to see that file if you don’t mind please. Your blog is very inspirational and helpful, thanks very much. Really useful advice…thanks for making it much clearer than many other guidelines! I have one question though – I have created my scroll bar as you outlined and it all works (used to increase percentage complete of a task within a project). What I want to do now tough is copy and paste what I have created so I selected the cell in which the original scroll bar was placed and pasted it in the destination cell, but the pasted bar is still linked to the original cell. Is there any way to make a scroll bar relative to the row in which it sits? I am very sorry for the long delay in responding. I do check my messages here but Word Press is really bad at letting me know some messages have arrived. 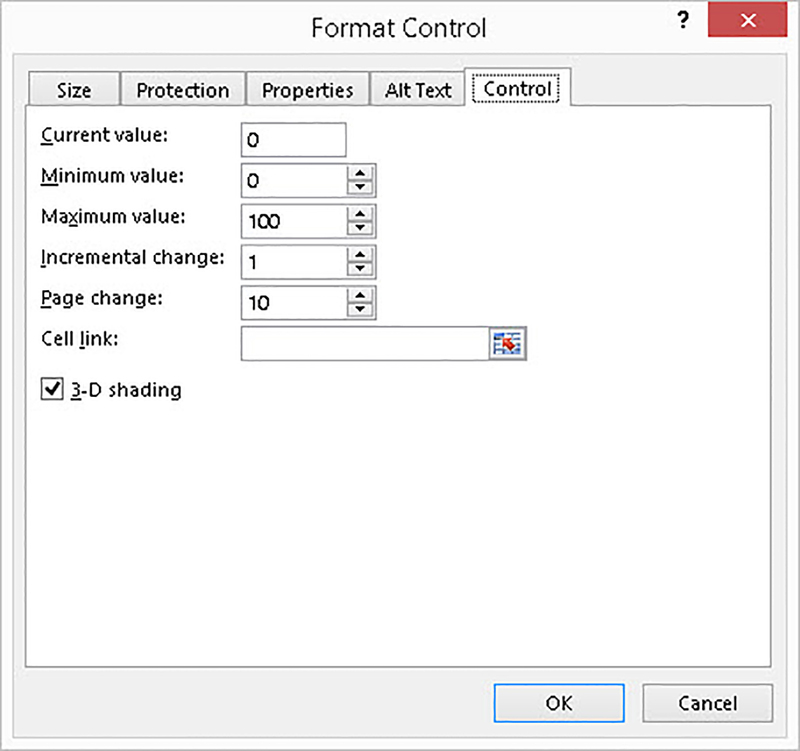 What you need to do when you have copied and pasted your scroll bar is to change the Cell Link and/or to change the formula in the cell you are trying to control. When you copied and pasted you PROBABLY need to change the cell link to something different from I24. Your VLOOkUP function will then need to be changed from I24 … then your new scroll bar will work. Apologies again for being late but do contact me again and I will make sure I respond much quicker.